As empowered women – we want to make sure you know how to defend yourself if you’re ever in a situation you need to get out of. So we’re bringing in the strongest woman we know to teach SWMH members and attendees self defense at our SWMH Nov. 1st event. 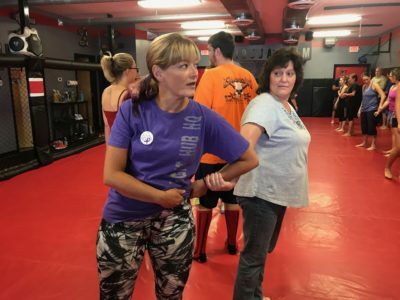 AJ Clingerman specializes in self-defense training for women, and is Co-Owner of Fight Hub with her Black Belt in Brazilian Jiu Jitsu (BJJ) husband James. AJ is trained in BJJ, Kickboxing and competes in grappling tournaments.